For those of you who were unable to make the General Membership Meeting, and for those of you who want to take some more time to read the slides (I went through my portion pretty quickly, due to time constraints), the slides are now posted here (or click on Membership > Presentations). Results from the Spook Hill 4 Mile Run have been posted. 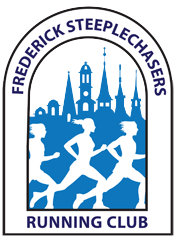 Results from the Baltimore Marathon have been posted. 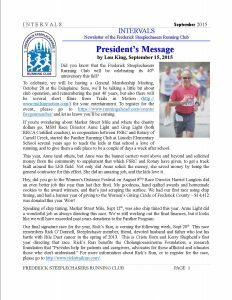 Thank you to Malcolm Senior for the many years he has put into producing our club’s wonderful Intervals newsletter! Every month we analyze the membership statistics year on year. But this is now something you can do yourself at any time. Click here and move your mouse around or tap your screen to see the statistics on a given day of the year.